Tomorrow is Joan's birthday. I'm a big believer in birthday celebrations. Considering that we so rarely take time to appreciate the gift of life, birthdays remind us to do so, to make much of the people we love (or even just like). Besides, Joan's had a difficult year. And of course, birthdays are an excellent excuse to eat. In my office building, birthday celebrations are often fraught with much angst. In the past year, especially, it seemed that some people were being feted, and others were being forgotten. Some people had lots of colleagues who were willing to chip in for party fare, and other celebrations were left to chance. Some people were buying all of the cake all of the time. So just recently, we went back to the "monthly" celebration idea: everyone contributes $10, and we all eat all year long, and there is the usual underground grumbling about the fact that people don't feel like donating to the cause. In principle, this is a good solution for a building full of complicated relationships. No one is left out, everyone is treated equally, and there is plenty of cake. Except it means that there are no home made birthday cakes (because the default is to get the share of the tiller, pick up grocery store cake, slice, and serve). Which I think is a complete travesty. So I made a cake anyway. This one is actually pretty good for you, courtesy of my husband's stepmother, who is a genius of substitutions, and I tweaked it a bit myself. I will likely pick up a second small cake on the way in tomorrow, in case there isn't enough food, but everyone will know which is the better treat. And I suspect that Joan will appreciate something made with care and thought, something that won't make us all lapse into a sugar coma by mid-afternoon. Did you know, by the way, that the phrase "let them eat cake" isn't even attributable to Marie Antoinette? Apparently, it was coined by a princess who was oblivious to the plight of French peasants, who had no bread; she thought they could simply nibble brioche, instead. Wouldn't the world be a better place if our world leaders made sure everyone had enough cake? Well, I can start small, I guess. Preheat oven to 350 and coat 12-cup bundt pan w/cooking spray. Whisk together flours, cocoa, baking powder and soda, pumpkin spice and salt in bowl. 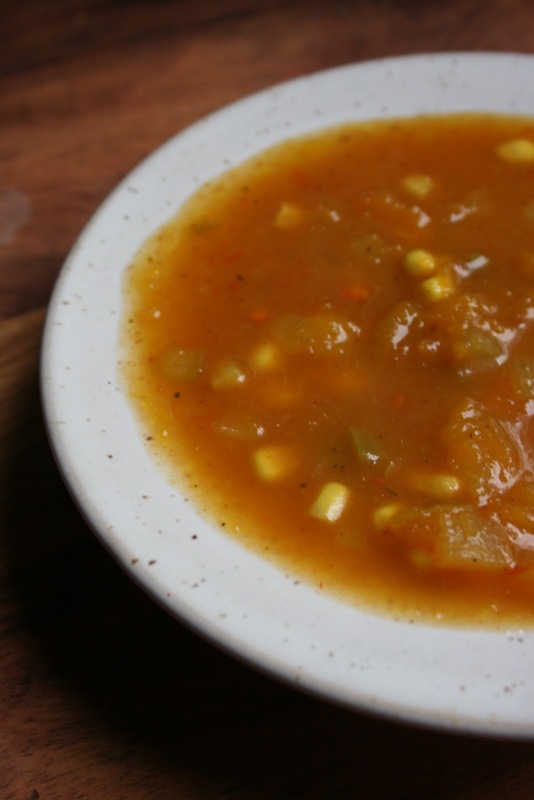 Blend buttermilk, pumpkin, applesauce, apple butter, brown sugar in a separate bowl at low speed. Blend in eggs. Stir maple syrup, vanilla, and espresso powder. Gradually add dry ingredients to wet ingredient stirring only sufficiently to mix. Transfer batter to bundt pan and bake 1-1/4 hour. Let cool for 15 minutes and remove from pan. Let cool completely before glazing. Combine buttermilk and confectioner's sugar by stirring. Drizzle on cake and garnish with chips. This year, during the offering at our church's Christmas service (which is nontraditional, at best, given that we attend a UU fellowship), our minister told us that in the spirit of the season, we were going to get gifts. I was a little surprised, knowing how modest our fellowship budget is, but felt myself getting excited by the thought. When they passed around the "gift" baskets, I was initially disappointed; they were just tea lights. But when I turned mine over, on the bottom was printed a single word: balance. If there is one thing I need more of in my life, it's balance. No one could have chosen a more appropriate gift for me. And while I can't say that receiving it has instantaneously improved things in my life, I do keep that tea light in my coat pocket, and am reminded about the gift every time I dig my hands in to fish out my gloves, or reach for a tissue, or just warm up. Divine intervention? Maybe. It almost doesn't matter. There is always too much to do on the weekends; seems we're always running to a birthday party, or going to youth group, or running errands, or doing chores, or making dinners for the week. Even when I'm home, I'm not home; my mind is somewhere else, planning the next thing, worrying about a future that isn't even a certainty. I desperately miss going to yoga class, especially at Yoga Loka with my guru Bonnie Pariser, which seemed to help keep my frenetic pace in check, reminding me gently to be centered, but I just can't figure out where to fit that in any more, without missing precious weekend family time. I confess I've never bought (or eaten, for that matter) okra, so it was an experiment, but everyone (even Ian) gobbled it up, so I think it was a success. 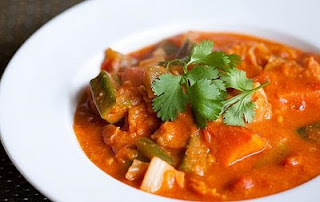 The stew itself is a good balance: of sweet and spicy, smooth and chunky, fork and spoon. I served it to the boys with couscous, but ate it plain myself. And there's plenty of leftovers, so that even if I'm not getting myself to yoga class, at least I'll have one less night to worry this week about finding time to make dinner in the midst of everything else. In a large pot, sauté onions in oil for about 8 minutes. Stir in cayenne, garlic and ginger and sauté for 3-4 minutes. Add cabbage, green pepper and cubed sweet potatoes and then cover for 3-4 minutes. Mix in tomato juice, apple juice, and tomatoes. Cover and simmer on medium-low heat for about 15 minutes until sweet potatoes are tender. Stir in okra and peanut butter. Simmer on low-heat until ready to serve. If stew is too thick, add water or more juice if desired. Add more spices or salt to taste if desired. Enjoy! I'm sort of glad to be back from Washington. My talk is over (until I give the next version in March, anyway) and I can resume worrying about other things, including the steady stream of applications for various programs at work that will be headed my way, starting Friday. But I already miss going out adventuring at mealtimes with my co-presenter, who, it turns out, is as much a foodie as I am. I love eating with people who take a bite and actually exlaim, "mmmm!" We had a particularly memorable dinner at the Lebanese Taverna at the Woodley Park-Zoo Metro stop; I'm still pining away over the lamb, which was (praise be!) humanely raised, and the vegetarian plate of spinach pie and baba ghanoug and beans and falafel and hummus and lentils was one of the most amazing things I think I've ever eaten. On the other hand, I need to get back to simple things again, things that don't make me feel like I've completely engorged myself when I eat them (like, say, vanilla cupcakes from Starbucks, or vanilla ultimate cake from Wegmans, both of which I ate with great gusto on the train, the former on the way down, and the latter on the way back). I decided to make a batch of potato leek soup this weekend, since I had a leek left over from last week, and it would mean wasting fewer brain cells over grocery shopping and meal planning. It's not exactly comfort food, but it's close. 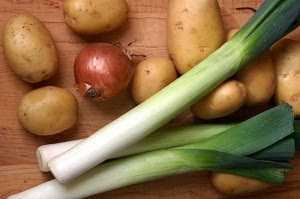 I remember eating this soup when I was growing up, with leeks from my father's garden; we would always grow too many (of everything, not just leeks), and this was my mother's go-to solution. And I need comfort this week, sustenance to face the office again. I've been brooding today over the sermon our minister gave, entitled "It's Not About You," on the prevalence of navel gazing in the U.S.. We're definitely looking outward this week, in the aftermath of the Haiti earthquake, and worrying about our own self-actualization seems pretty shallow. I was feeling a bit guilty, listening to him and thinking about just how much navel gazing of my own I've been doing of late, thinking about quitting my job and going to yoga teacher training at my favorite yoga studio in Frenchtown, where I can achieve enlightenment and eat at my favorite cafe, which is moving to Elizabeth Gilbert's storefront. The thing is, as I confessed to him later, I feel like I need some navel-gazing time. I spend most of my waking hours taking care of other people: at work, at home, even in my extracurricular responsibilities with the youth group, Caring Committee, and various committees at my son's school. A while ago, my friend Jennifer posted a quote from a Mary Oliver poem: "Tell me, what is is you plan to do/With your one wild and precious life?" If that doesn't invite us to a long detour through self-absorption, I don't know what does. If only the answer were as simple as "make soup." Render the bacon in a large pot. Remove and set aside for crumbling into soup later. Add leeks; cover and cook over medium heat, stirring occasionally, until soft, about 10 minutes. Add potatoes; cover and cook over medium heat, stirring occasionally, until soft but not brown, about 10 minutes. Add broth/stock; cover and simmer for about 20 minutes. Remove soup from heat; puree with a stick blender (or blender of choice). Garnish individual servings with crumbled bacon and chopped chives. Pregnancies seem to come in waves around me, and right now, I'm watching a tsunami approach. One of the staff members is due in March, another has a daughter who will give birth in February, one of the women in the working moms group I run is due at the end of January, another is due with twins some time in January, and one of the women in my little wing of the building at work announced that she, too, will join the ranks of motherhood in August. To hear some women talk about it, getting pregnant and making it through the nine months to delivery is a snap. And for some women, it is. My first pregnancy was very uneventful (until the end, when my son teased us with a potential breech birth and I did all sorts of bizarre things to convince him to turn, not the least amusing of which was lying upside down on an inclined ironing board, playing music and shining lights at the far end of my large belly). I could almost have been convinced that every pregnancy was like that. But even then, I knew better. I had a friend give birth to a stillborn child before we conceived our own, and I knew of another few couples who had lost a pregnancy early on. Now, three years after the birth of my son, I, too, have had my own experiences (unfortunately plural) with loss in pregnancy, and more recently, have become just plain frustrated with my uncooperative (and admittedly, aging) body. Watching the tidal wave fills me with simultaneous hope, and fear, and jealousy. So I do what I always do when I don't know how else to cope. I bake. Tomorrow I will bring some of these to the newly pregnant young woman at work, who looks green in the morning and shuts her door to try to get some work done. I will tell her that ginger and lemon will help her to fight the queasiness, and reassure her that she'll feel like herself again soon. I will also bring some to our next door neighbors, whose (60 year old) daughter is in the hospital with septic meningitis. Because, as any parent knows, the delicate balance of hope and fear, which, I suspect, is part of what makes us human, does not end with birth. Here's to life, and to the healing powers of things from the oven, made with love. Preheat the oven to 375F. Line a standard-size muffin tin with paper liners. In large bowl, combine the whole-wheat flour, flaxseed, oats, ground ginger, and baking soda. Stir in nuts. In medium bowl, combine juice concentrate, eggs, oil, vanilla, fresh ginger, and lemon zest. Whisk to blend. Add the juice mixture to the flour mixture, and stir gently just until the batter is smooth and well blended; do not overmix. Gently fold in carrots. Spoon batter evenly into prepared muffin tin. Bake about 20 minutes, until a toothpick inserted into the center comes out clean. Transfer to a wire rack and let cool 10 minutes. Remove muffins from tin; let cool completely. Muffins can be stored in an airtight container for 3 days or individually wrapped in plastic wrap (and then in an airtight container or freezer bag) and frozen for a month. For most of my life, I've lived within an hour of New York City, a cultural mecca of foodies everywhere. And yet, oddly enough, foodie that I am, I can probably count my yearly trips to the city on a single hand, and never have I gone simply to eat. I do, however, have a long list of restaurants and bakeries I've wanted to visit there. The List (which really does deserve capital letters) is so long that some of the places on it have been on it for years. At times, I'd toyed with the idea of spending a day eating my way around New York. But the prospect of seemed so terribly decadent and unproductive (after all, there is always laundry to do, and email to answer, etc.) that I'd dismissed it. So you can imagine my surprise when I mentioned this to one of my friends, who is also a WOHM of a young child, responded, "that sounds amazing. When are we going?" I should mention, here, my persistent guilt about going anywhere without my son on the weekends. It's the only time I have to spend a whole day with him, and, to borrow a metaphor from T.S. Eliot, sometimes I wind up measuring my life out in coffee spoons, counting the hours that I am or am not being a "present" parent. As it is, I worry that he is even cheated out of the time we're together, when, inevitably, I'm thinking about recommendations I have to write, or a conference call I have to make, or dinner I have to plan. This is ridiculous, I know; my son knows I love him, and the time I do spend with him tends to be high quality time (e.g., we're more likely sitting on the couch playing train than watching DVDs). Still, I needed external motivation to commit to an afternoon away. I work better when I'm feeling obligated. So I started scheming. Where would we go? How much ground could we cover? The type A planner in me took over, we committed to a date, and the day began to take shape. By the time I was done, I'd google mapped a tour of over 15 eateries. Donning long johns and ear-flapped hats and toe warmers to shield us against the promised single digit temperatures, we set out to conquer as much as we could in a single afternoon. On the train in, we wound up talking about Elizabeth Gilbert's Eat, Pray, Love, which my friend was happily devouring, having been unable to read any book in its entirety for some time. She expressed feeling a kinship with Gilbert that I remembered feeling myself when I was reading the book; not that I want to escape to Bali and ditch my husband, but that I have sometimes (okay, often) quieted the pleasure-seeking spirit-seeking love-seeking parts of me in favor of responsibilities I've invented for myself. In a way, we realized later, our adventure was in the spirit of Gilbert's book: we were allowing ourselves to indulge in pleasure, and not feel guilty about not being home, not doing the laundry, not doing the myriad of other things that we feel we need to be doing on the weekend as parents who work outside the home. I was having such a wonderful time just traveling and talking that I started to worry that the food might not live up to our expectations. Our first stop was the minimialist Momofuku Ssäm Bar, whose pork buns are legendary. My mouth watered as we stepped into the restaurant, but we weren't prepared to sit down, so we ventured through the back corridor to the Milk Bar, where pork buns were also available at small standing-room only countertops, and where we ogled such things as crack pie and sampled their gingerbread soft serve as we waited for my name to be called. I also ordered one of their famous Compost Cookies (made with pretzels, potato chips, coffee grounds, oatmeal, chocolate chips, and butterscotch chips) for later, in case I got hungry. (It was, incidentally, amazing; I was able to restrain myself until the following morning, and shared half with my husband.) The buns weren't what I expected: they were more like small fluffy flatbreads, folded over taco-style to envelop melt-in-your-mouth pork fat (OK, there was some meat, but it was an afterthought), tamarind sauce, and a pickle. I was a little disappointed, but still, they were tasty, and I had been craving something savory. My next planned stop was Chikalicious, which had just opened for the day. Though we stepped inside to get a feel for the place and inhale deeply to enjoy the heady aroma or caramel, we agreed that it was too early in the game for dessert and for a long-term commitment, given our ambitious plan. "For part two," N. reassured me. We did sit down at the Caracas Arepa Bar (To Go), though, a cozy little place with chattering in Spanish and intoxicating smells, where there was barely room to move. Fondly remembering my many childhood visits to the Union City Cafeteria for black beans and plaintains, I squeezed myself into a chair behind a tiny table in the corner, and N. ordered us a "chupi chupi" (a smoothie-like berry drink) and an arepa with black beans, cheese, plantains, and peppers, appropriately titled "La Mulata." It was superb, once I discarded the jalapenos, which threatened to burn off my lips. Every bite revealed a new layer of flavor: sweet, salt, spicy, tangy. On our way out the door, N. asked the cashier for the ingredients in the bottled yellow sauce on the way out, and was told that it was a "secret." I grinned. Yes. Exactly. Perfect. As we meandered down the street on our way to our next destination, we happened upon someone offering free sample size cafe mochas outside another bar. We accepted his kind offer (after all, how often do people offer you free anything in New York? ), deciding that the mochas were decidedly mediocre, but warm was good, and being amused at the universe's obvious approval of our trip. A bit further down the street, I spotted the Black Hound Bakery (a favorite of mine from years ago, when I'd just begun to discover buttercream) and suggested we go take a look. To my pleasant surprise, there were more samples: moist bittersweet chocolate and rich vanilla Checker Cake, and snappy gingerbread people. By this time, I had decided that this was a wonderfully productive way to spend my afternoon. Our next destination according to the plan was Sugar Sweet Sunshine, but as we were walking N. spotted a cupcake bakery called Butterlane, and we decided to poke our heads inside. 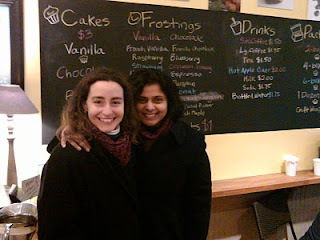 As we stood just inside the door reading the chalkboard menu and smacking our lips, we listened with amusement to the conversation next to us, where four people on overstuffed plush chairs were sampling twelve cupcakes, debating the finer points of frosting and cake moisture. Turns out they were from Cupcakes Take the Cake, and though we were wary of indulging in too many cupcakes, they convinced us that we needed to sample the goodies here before heading to our other stops. After much debate, we ordered a banana cupcake with cinnamon honey frosting. All I have to say about that experience is ... OH. MY. GOD. The best cupcake I think I have ever eaten. Moist, not cloyingly sweet, with just the right amount of fluffy frosting. I went to say something to N., who replied, "wait a minute. I'm having a moment. Let me just have my moment." She was right. It was meditative. I decided to meditate, too. I was disappointed that this place wasn't at the end of our tour, because I could easily have been convinced to bring home a dozen. I hope that some nice person who regularly travels from my neck of the woods to New York will be kind enough to read this and deliver me a dozen? 'Kthanx. After that, Sugar Sweet Sunshine was a little disappointing. We waited on the long line, and were rewarded with drier cake, despite a lovely fluffy swiss buttercream. N. had an Ooey Gooey (chocolate almond buttercream, with chocolate cake), and I had a red velvet. I was nonplussed. The bar had been set pretty high. Though Babycakes had also been on my original tour itinerary, we decided to skip it, concerned that no other cupcake would now live up to our high standards, holding out for Billy's Bakery, our last cupcake contender. We pressed on (stopping briefly in Essex Street Market, where we found samples of Roni-Sue's chocolates --the buttercrunch and caramel apple truffles were just lovely!) to Laboratorio di Gelato, where we sampled pumpkin, the maple walnut, and the hazelnut. N. was underwhelmed (of course, she had recently spent time in Rome, eating gelato every night, so she was bound to be a tough critic), andI didn't love it well enough to get a full serving. It could have had something to do with the fact that it was about 20 degrees outside, but the jury is out. Rice to Riches was a much more successful foray; all told, we sampled about ten different flavors, including the cheesecake (too sweet), rum raisin (too much rum), almond (a good balance of salt and sweet), original (wonderfully creamy, and less sweet), and cinnamon raisin (perfect balance, and our final purchase for N's husband). I love the funky futurama vibe there. Next door, N. convinced me to sample Pinkberry, which I found pleasantly more tart than the one on offer at the tart-yogurt chain recently opened in New Brunswick. We managed to thank the friendly yogurt-pusher and escape before purchasing a cup; I'm sure I'll go back, but I wanted to pace myself. Though we'd meant simply to cut through Spring St., before we knew it, we were shopping: sampling the fig apricot lotion at fresh, laughing at the cheerful array of brightly colored things that made us smile at Pylones (we both walked away with wind-up ladybugs), marveling at creme brulee ramekins in Sur La Table, where I found a small whisk and a fire truck cookie cutter for Ian. Part of me wanted to rush us through, but another part of me realized that this unplanned experiment was exactly right; that I should allow for the flow of the tour. And Fortune smiled down on us: a bit further down the block, I realized that we were just about to pass Baked by Melissa, which, coincidentally, I'd heard about during my last visit to the city, standing in line behind a woman at Balthazar who was carefully protecting her tiny cupcake jewels from the jostling crowd. I was thrilled! What luck! I'd been thinking about that place at Sugar Sweet Sunshine, unable to remember its name. We gobbled up a bite-sized Peanut Butter and Jelly, Red Velvet and Chocolate Mint. (N. thought the chocolate mint was a bit dry, but the others were delightful). We were headed for Kee's Chocolates, but by the time we got there, the selection seemed small, and neither one of us wanted chocolate, having just sampled Red Fire tortilla chips at Vosges, which was a pity. 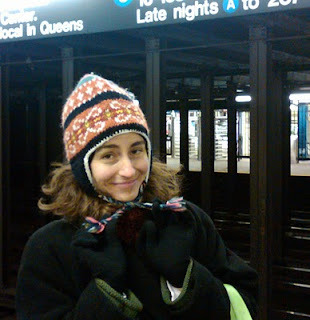 Evaluating the rest of the itinerary and deciding that it was entirely too ambitious, we decided to cut our tour short and head back uptown on the subway, making only one more stop before dinner. I was strangely hungry. At Billy's, we picked up a banana cupcake for the ride home (to do important comparative research with Butterlane, of course), as well as a chocolate cupcake (special request from my son) and a carrot cake cupcake (for N.'s husband). We stuffed all of this into my now-bulging canvas bag, and walked one block west for savories. Tia Pol was packed; one could hardly squeeze through the bar far in enough to leave one's name, never mind take a seat. But despite the promised half an hour wait, we managed to nab a seat at the bar in less than 15 minutes, and ordered lamb albondigas, an ensalada de alcachofa, mushroom and manchego croquetas, and guapiles. Then came patatas bravas and a lovely fava bean and beyos paste on toast. Having eaten ourselves silly, we staggered to the train station and began the long journey home. The funny thing about all of this is that we didn't even actually eat all that much until dinner (except possibly the arepa), but it was such a wonderfully decadent day. Tonight, I will digest, literally and figuratively, thinking fondly of the bounty of sweets and savories. And I will revel in the experience of unadulterated pleasure, which is, after all, pretty damned productive. Somehow, I've managed to feel overwhelmed already, and it's only January 5. It's less that I'm working a lot, and more that I'm working at worrying: about my upcoming conference presentation, about not spending enough time with Ian, about managing the four committees I'm on after-hours, about finding the energy to go to the 24 hour gym for which I'm paying membership (I did go regularly at 10pm before the holidays, but that is getting old ... and apparently, I'm tired and lazy). One thing that I do to try to manage responsibilities at home a little better is cook meals in advance, and in large enough quantities so that we can eat at least twice from the same pot during the week. Not infrequently, I find myself stirring something on the stove at 11pm, in preparation for the next few days. To me, winter calls for comfort food: both because of the bone-chilling cold, and because the days are still long and dark. And for me, in January, comfort food means soup. And so, last night, as I participated in a 9pm conference call on the marketing committee for my son's school, I was stirring a pot of this. Doubtless, you've looked at the title of this post, and dismissed it already; you've eaten enough pumpkin. There was Thanksgiving, and then Christmas, and then the leftovers. The truth is, you'd never recognize the pumpkin here. Think of it more as a superfood soup that allows you to pretend you're keeping your New Years' resolutions to eat better (yes, I know, you snuck into the cabinet last night and found a chocolate bar ... don't worry, your secret is safe with me). This soup whips up in under half an hour, is flexible enough to accommodate your tastes, feeds a small family, and is wonderful with a crusty bread. Go make yourself a pot of it right now, and chase away the January blues. Saute pepper and onion over medium head in a large pot until translucent, about 8 minutes. Add curry powder and saute for one minute. Add remaining ingredients through sage, and simmer for about 20 minutes, until the flavors begin to blend. Season to taste with salt and pepper, and garnish as you wish! This soup keeps and freezes well. There is something about blustery winter days that require a wood burning stove. My two favorite high school English teachers (who, quite conveniently, are married to one another) knew (and still know) this; we hunkered down next to theirs today for a pleasant visit filled with conversation and kitten antics, coveting one (kitten and stove) of our own. Ian behaved himself beautifully, even if he didn't completely self-entertain. We talked for a long time about everything from mystery novels to good kielbasa (Michael has a fondness for smoked meats) to veterinarians, and they brought me up to date on the activities of my former schoolmates. As we were talking, it occurred to me that though they have no children of their own, they've collected so many of us over the years ... the misfits, the lonely ones, the ones that have been brainwashed by well-meaning parents. I spent many nights on a fold-out futon in their "mystery room," a room lined with built-in bookcases filled with tattered novels, and I remember waking up many mornings feeling so lucky to be there, warm bowl of oatmeal waiting for me in the kitchen along with a steaming mug of Earl Grey tea (with or without milk, as you please). Sometimes I went with my high school best friend, but as we grew apart, I found my way there alone. They called their house Bryn Myrddin--Merlin's Mountain--and it was a fitting name, somewhere you could hide away. And as adults, many of us still return, bearing only a paltry six pack of beer in gratitude for their unconditional love, their warm welcome, and their unwavering support. Mare had to leave early today to see her own parents, who are aging less than gracefully, it seems, leaving Michael to entertain us and feed us the always-delicious always-simple lunch (usually, in the winter, involving homemade bread and soup). Watching her go, I wished I could take care of her, shielding her from her demons as she has shielded us all these years. When I got home, I baked a batch of granola, which I've been perfecting this winter break. It's loosely based on the recipe from this blog, by the Leftoverist herself, but I've modified it a bit. She admits that "all granola recipes are just a scaffolding for whatever you want to do or whatever you have in your pantry." It seemed like the right sort of thing to send full of health and energy-sustaining ingredients, and nutty, like we are. I hope it helps, or that at the very least, it reminds her how many of us love her for the generous gift of herself, so freely given, these many years. Heat oven to 350 and line two baking sheets with parchment paper. Combine oats, nuts, and seeds in a large bowl. Mix oil, agave nectar, and salt well. Pour over oats, mixing thoroughly. Spread out onto baking sheets and bake for 20-30 minutes until brown, checking often, stirring occasionally, and rotating baking sheets halfway through. While oats are cooling, add cranberries and ginger, stirring thoroughly. 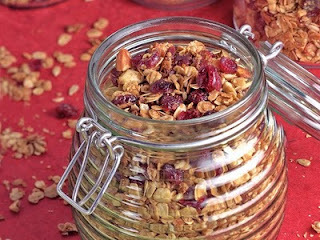 Transfer granola to an airtight canister(s). I don't make New Years' resolutions. At least, I pretend not to. But I have my list, of course ... the things that I keep meaning to do to change my life, or perhaps nudge it along in the right direction. One of them is blogging. I read blogs, particularly food blogs, and think, gee, why shouldn't I have fame and fortune, and travel to BlogHer? I bake cupcakes, cookies, granola, and a host of other things. That accounts for perhaps half of my cooking. (Some people have told me I'm good enough at it that I should open a bakery. I revel in this praise, but have not mustered up enough courage to do anything about it.) The other half is attempts at healthy meals for our little family, in the minimal amount of time I have as a full time working outside the home mom. Sometimes I think I'm a little half-baked, myself, hence the blog title; I am a work in progress. But honestly, some things are just better when they're still just a little gooey in the middle. So here goes ... a half-baked blog for a new decade. I'm hoping to use this space to be reflective about my own journey, and to join a community of people who will help me to finish the baking.